With the Holiday Season soon to be upon us, I thought it might be wise to give you some tips on how to maintain and balance blood sugar levels using Propolis and other natural supplements before you find yourself at the table full of sweets! You'll also find an interesting article I've written on the anti-aging effects of bee pollen. As always, you'll find a valuable coupon below. 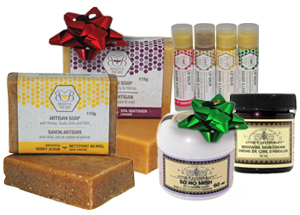 You'll also find our popular new gift packs from Beauty and the Bee. Be sure to have a look at the different skin care packages we put together - the Spa Package is proving to be quite popular! One of the most popular things we do each Holiday Season in The Honey Shop is prepare honey based gift baskets. We've decided to make them available to you and will be shipping these this year. Thanks again for supporting Bee Pollen Buzz! One in six people now have pre-diabetes and one in fifteen have full blown diabetes. Are you one of them? Blood sugar issues are epidemic in the Western World. Natural solutions to this huge problem are badly needed. As it turns out, the hive may offer one. In a recent study, scientists set out to investigate what effect, if any, propolis capsules had on blood sugar control and insulin resistance in rats with Type II diabetes. Slow Aging With Bee Pollen? I receive quite a few testimonials about the results that people from around the world obtain using bee pollen. What is very exciting is the research that scientists are doing attempting to decipher why bee pollen is so healthy for us. If you've heard of anti-oxidants then you know how important they are for our health. As it turns out, the reason bee pollen slows aging and prevents disease is because bee pollen happens to be one of the highest anti-oxidant foods that exists. Beauty and the Bee is a new line of hand crafted, luscious bee-hive based soaps, creams and lip balms designed and produced by Dutchman's Gold. We now have our popular skin care products packaged in the following packages, just in time for the Holidays! Learn more about these luxurious packages here. Come Holiday time each year, our Gift Baskets are extremely popular in our Honey Shop. We've found over the years that the gift of honey wins over even the 'hardest to shop for' person! We've got gift baskets in all price ranges starting at $12.50. Click on the images below to go to our order page.